I love teaching fractions to sixth graders despite the many obstacles that students might have to overcome. All students must master fractions to be able to master Algebra concepts later on. There are so many different ways to teach fractions from hands-on card sort activities, foldable notes, math stations, interactive notebook tools, and games. I've compiled a list of my favorite resources for engaging students in FRACTIONS. These dice games are intended to help students understand how to compare fractions, find equivalent fractions, add and subtract fractions with like and unlike denominators, apply and extend previous understandings of multiplication to multiply a fraction or whole number by a fraction, interpret and compute quotients of fractions and solve word problems involving division of fractions by fractions. -NO PREP Print & GO! These interactive notebook activities are intended to help students understand, interpret, and compute quotients of fractions and solve word problems involving division of fractions by fractions. 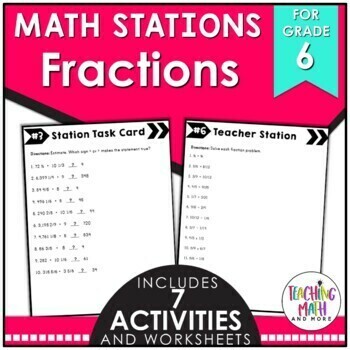 This math station activity is intended to help students understand, interpret, and compute quotients of fractions and solve word problems involving division of fractions by fractions. 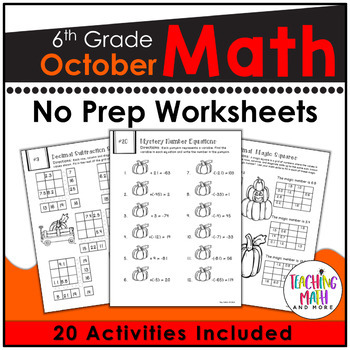 This October Math NO PREP packet that will keep your sixth graders engaged! This packet is just plain fun. Not only is it PACKED with sixth-grade common core math problems, it also gives students fun coloring, puzzles, and problem solving. Use this packet for bellwork, classwork, extra credit, fast finishers, or homework! *Packed with 6th grade common core math problems for review and practice. -Updated for 2016-2017 School Year! 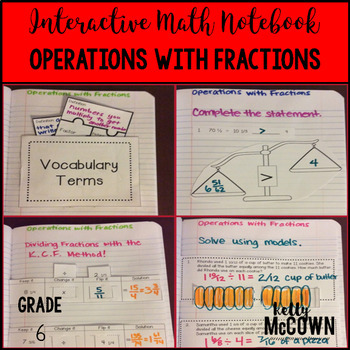 I hope these resources give you ideas for teaching operations with fractions. My favorite is the IMN activity where students have to "Keep it Change it Flip it" the fraction when dividing to find the answer. Students move the fractions in the interactive activity to come to the correct conclusions for the solution. 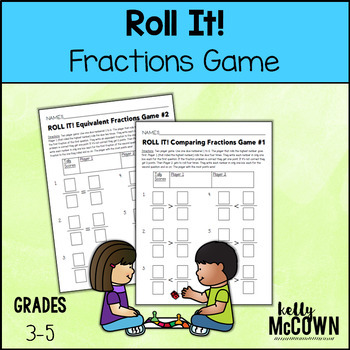 Make learning fractions fun and engaging in your classroom too!